"This simple hash works perfectly as a tasty addition to your morning eggs or a wintry side dish with roasted chicken." Place sweet potato in a microwave-safe bowl; add water and salt. Microwave until partially softened, 2 to 3 minutes; drain. Heat olive oil in skillet over medium heat; cook and stir onion in the hot oil until slightly softened, 3 to 4 minutes. Stir sweet potato, ham, cinnamon, cayenne pepper, and salt into onion; cover skillet with a lid. Cook sweet potato mixture, stirring occasionally, until sweet potatoes are cooked through, about 10 minutes; sprinkle with brown sugar. Cook and stir until brown sugar is dissolved, 1 to 2 more minutes. If the mixture begins to stick to the skillet, add a few tablespoons of water. Pretty good, and not unhealthy. I'm sure I'll make it again. I think the next time I'll finish it with a dab of butter. The mouth feel was a little dry. This was tasty. 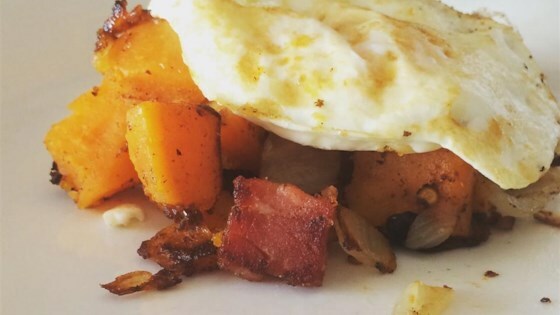 I doubled all of the ingredients and served it with eggs and toast as a breakfast dinner for my family. I make this all the time! Instead of the seasonings described, I use 1/4 tsp each onion powder and garlic powder, makes it savory. This was fantastic, made no changes hubby loved them. Made them twice first time with the ham. Second time forgot to buy the ham so I fried chopped bacon and it also turned out great.